Birth* Doris Banks was born on 3 October 1900 in York County, Ontario, Canada. 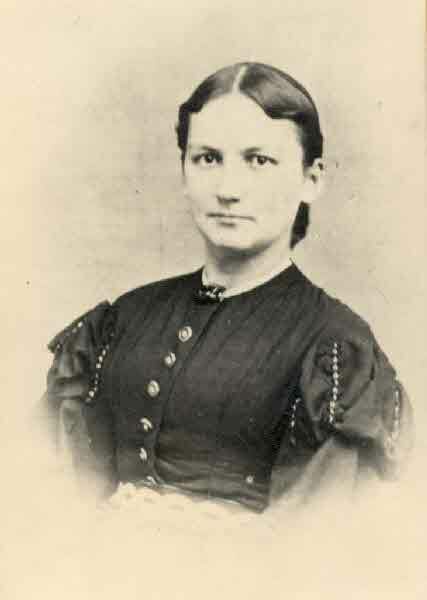 Death* Doris Banks died on 15 July 1902 in Toronto, York County, Ontario, Canada, at age 1. 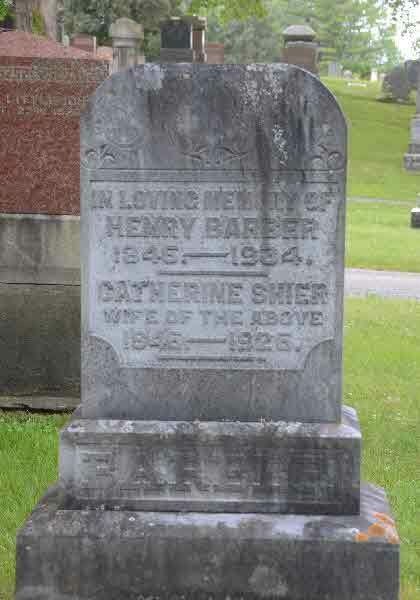 Burial* She was buried in Prospect Cemetery, Toronto, York County, Ontario, Canada. 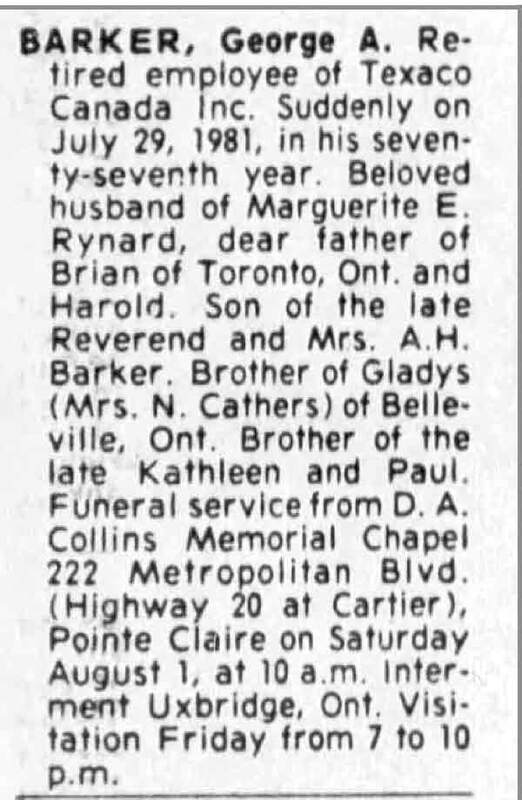 Death* Margaret Caroline Banks died on 2 July 2014 in Dufferin Oaks Nursing Home at age 80; SHIER - Margaret passed away in Dufferin Oaks Nursing Home on Wednesday, July 2nd, 2014. Margaret (Banks) Shier in her 81st year. 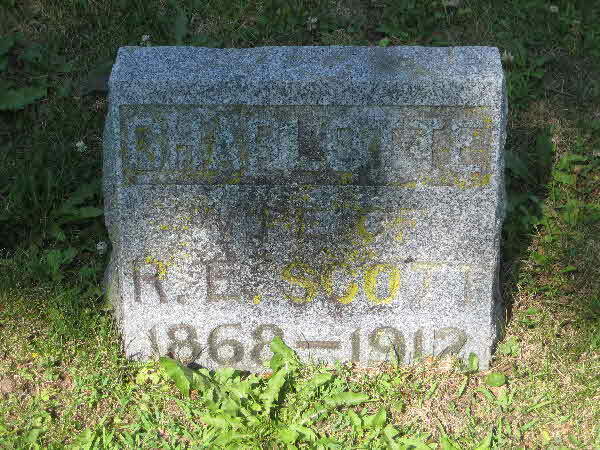 Margaret is survived by four brothers Robert (Grace) Banks of Listowel, Neil (Elizabeth) Banks of Dundalk, William (Wendy) Banks of Owen Sound and Alexander Banks of Corbetton, and a brother-in-law William Karn of Corbetton. Predeceased by her parents Lloyd and Isabella Banks, two sisters Isabel Banks and Ruth Karn and a brother Stewart Banks. Resting at the McMillan & Jack Funeral Home, Dundalk. 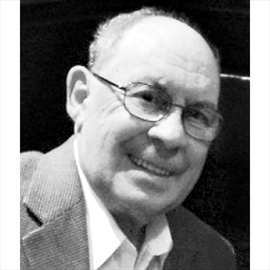 Funeral service will be held in the chapel on Saturday, July 5th, 2014 at 10:00 a.m. Interment in Shelburne Cemetery. 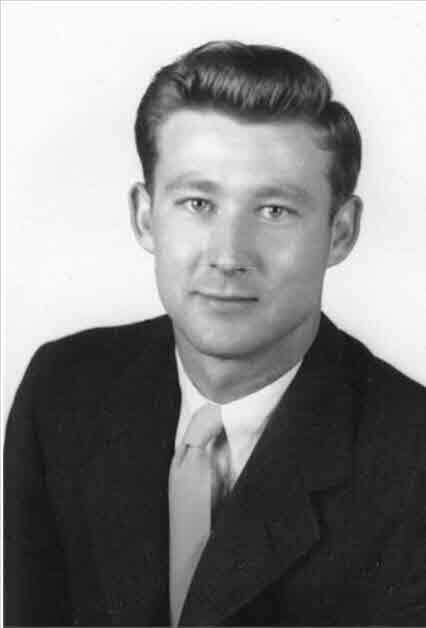 Visitation will be held on Friday evening from 7:00 to 9:00 p.m. 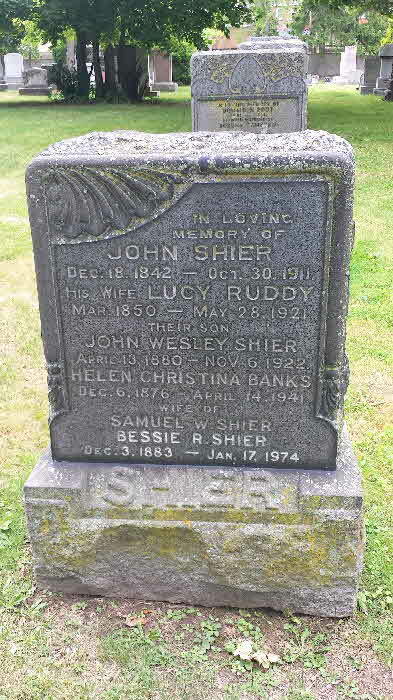 Marriage* William Banks married Lucy Rebecca Shier, daughter of John Shier and Lucy Ruddy, on 14 June 1899 in Toronto, York County, Ontario, Canada. 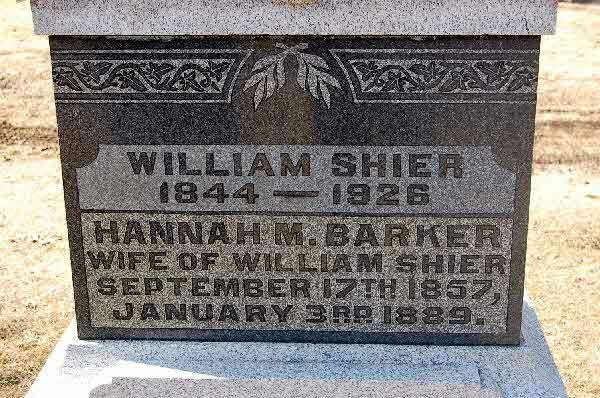 Death* William Banks died on 14 July 1931 in Toronto, York County, Ontario, Canada, at age 57. [S1] Ancestry.ca, online \Ancestry.ca\, Coombs-Morrison Family Tree by Robin Coombs. Hereinafter cited as Ancestry.ca. 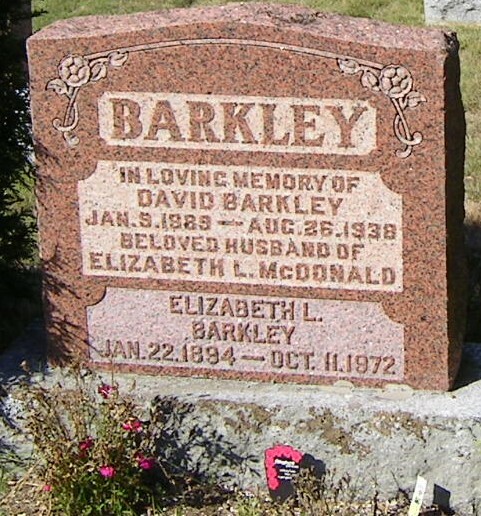 [S1] Ancestry.ca, online \Ancestry.ca\, Steven/Banks Famly Tree by kimthornton2001. Hereinafter cited as Ancestry.ca. Birth* William John Banks was born on 18 June 1906 in Toronto, York County, Ontario, Canada. 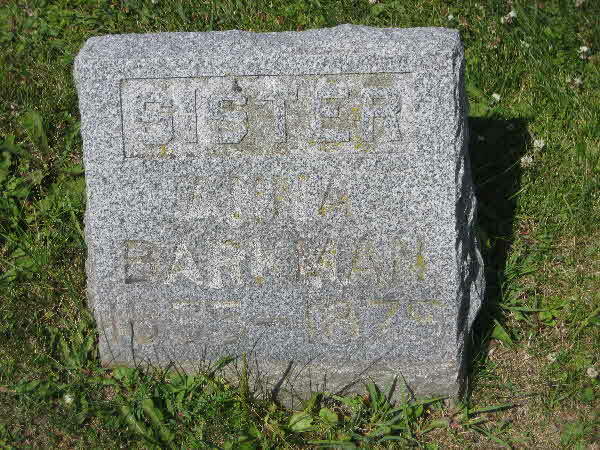 Burial* She was buried in Uxbridge Cemetery, Uxbridge, Ontario County, Ontario, Canada. 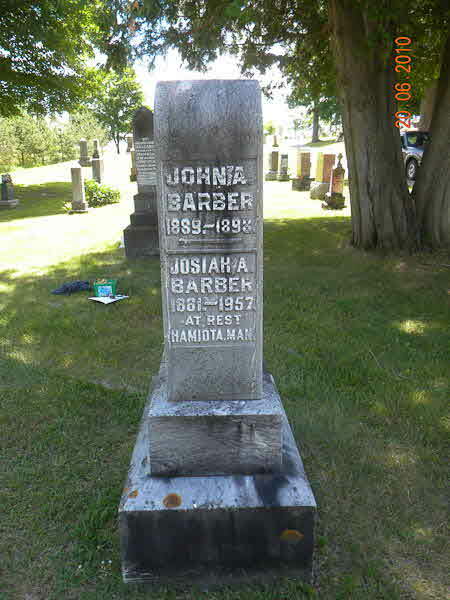 Burial* He was buried in Ontario County, Ontario, Canada. 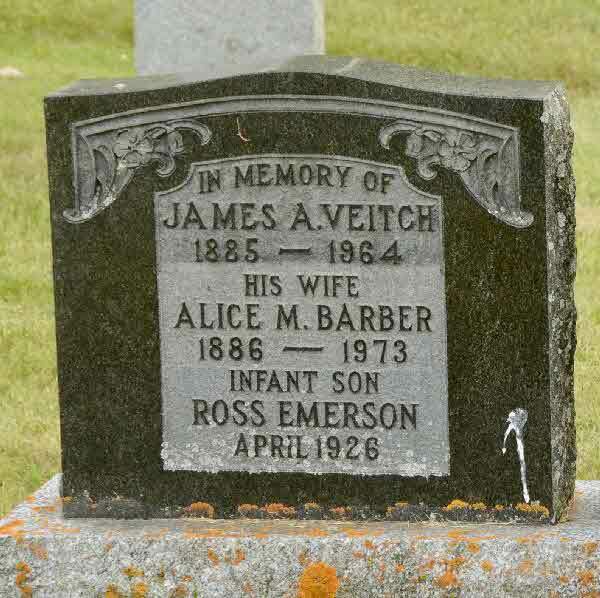 Burial* He was buried in Hamiota, Manitoba, Canada; Inscription also found on parents stone in Uxbridge Cemetery. 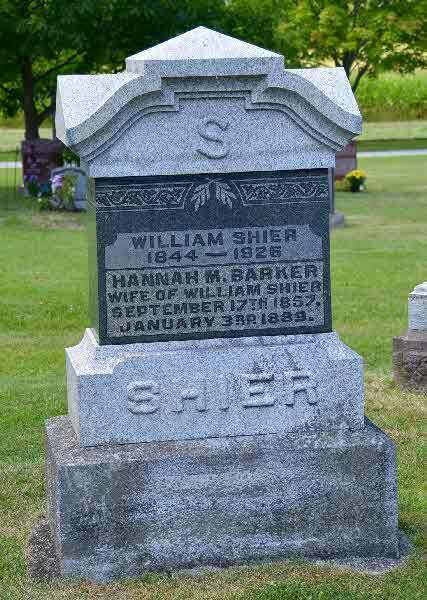 Death* Samuel W. Barber died on 5 July 1897 at age 20; Drowned in the mill pond near Lot 1 Conc 7 Reach Twp along with his older brother William. 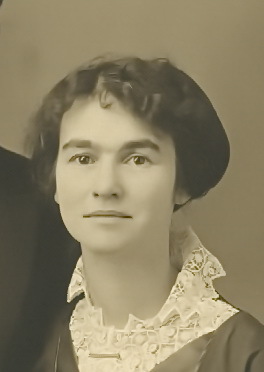 Marriage* He married Hazel Beatrice Glenn, daughter of William George Glenn and Ann Jane Shier, on 22 June 1922 in Toronto, York County, Ontario, Canada. 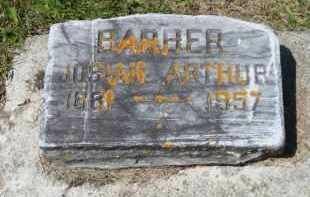 Death* William James Barber died on 5 July 1897 at age 22; Drowned in the mill pond near lot 1 Conc. 7 Reach Twp along with his brother Samuel. [S1] Ancestry.ca, online \Ancestry.ca\, Jim Smith Family Tree. Hereinafter cited as Ancestry.ca. 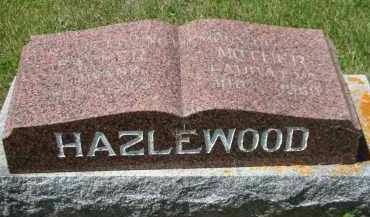 [S40] Saskatchewan Cemetery Project, online \, Saskatchewan Cemetery Project. 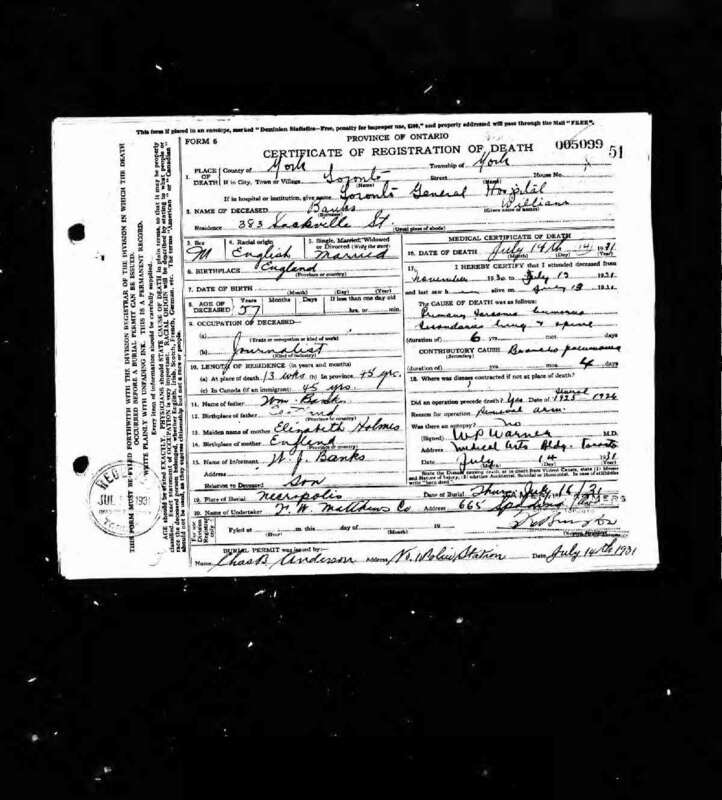 Marriage* She married Robert James Gordon Kennedy, son of Joseph Henry Kennedy and Jennie A. Keys, on 27 September 1916 in Toronto, York County, Ontario, Canada. 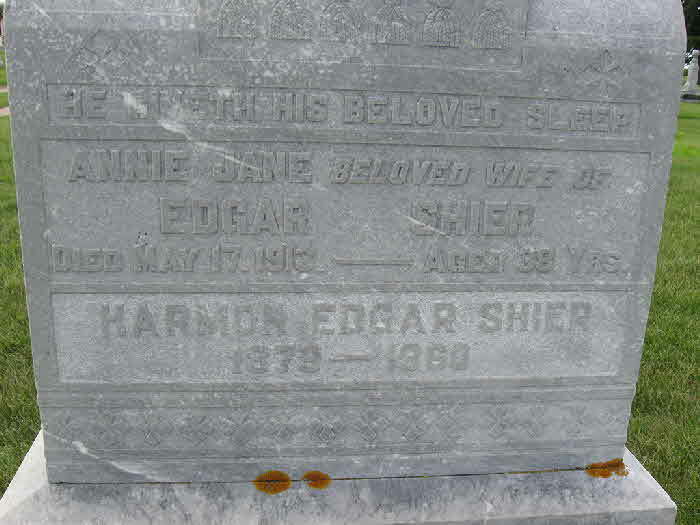 Marriage* Esther Maria Barker married Joseph Shier, son of Joseph Shier and Catherine Corneille, on 28 September 1887 in Ireland. 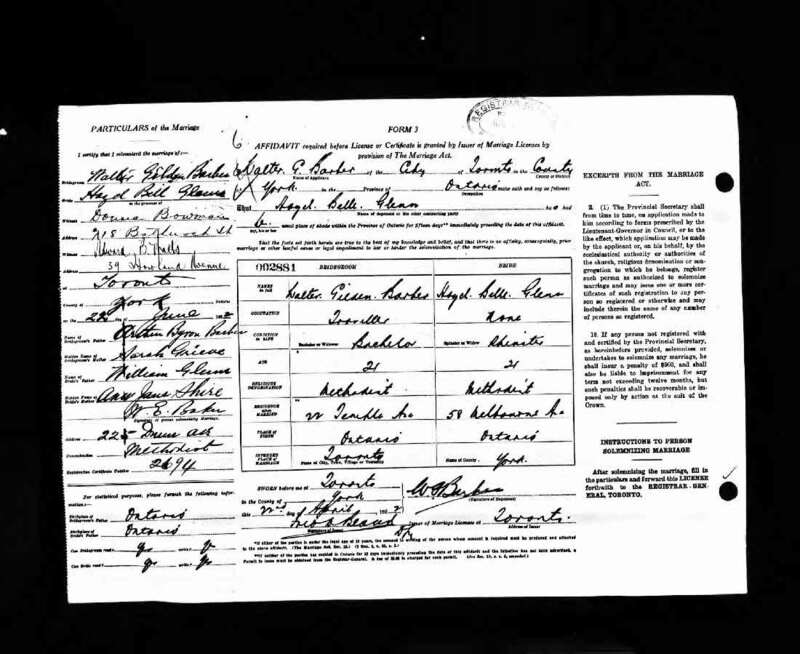 Marriage* George Albert Barker married Marguerite Elsie Rynard, daughter of Jacob Rynard and Janet (Nettie) Noble, on 2 October 1937 in Brock Twp., Sunderland, Ontario County, Ontario, Canada. Death* George Albert Barker died on 29 July 1981. 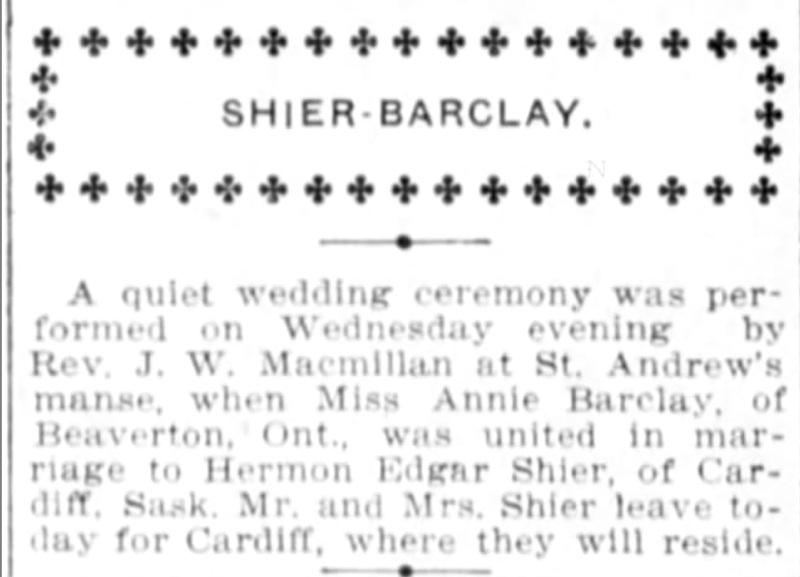 Marriage* Annie Jane Barkley married Harmon Edgar Shier, son of William Henry Shier and Rebecca Shier, on 17 July 1907 in Winnipeg, Manitoba, Canada. 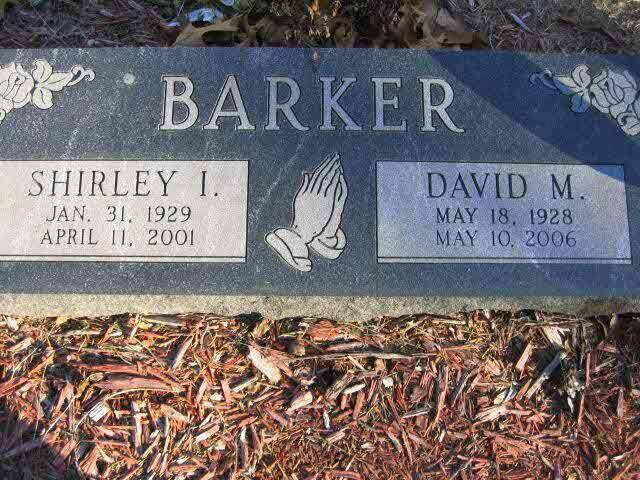 Burial* He was buried in Maple Leaf Cemetery, Echo Bay, District of Algoma, Ontario, Canada. 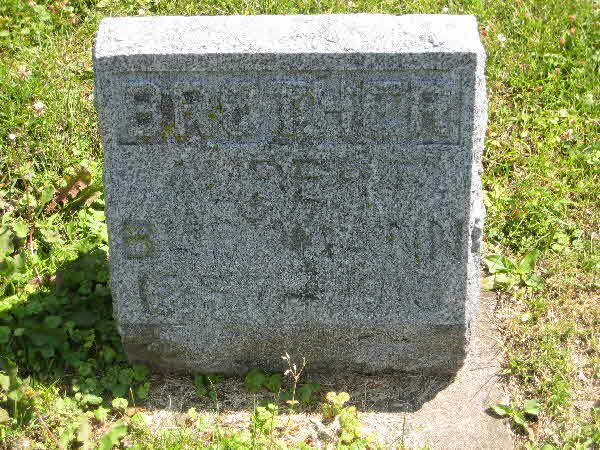 Burial* He was buried in Riverside Cemetery, Oshkosh, Winnebago County, Wisconsin, United States. 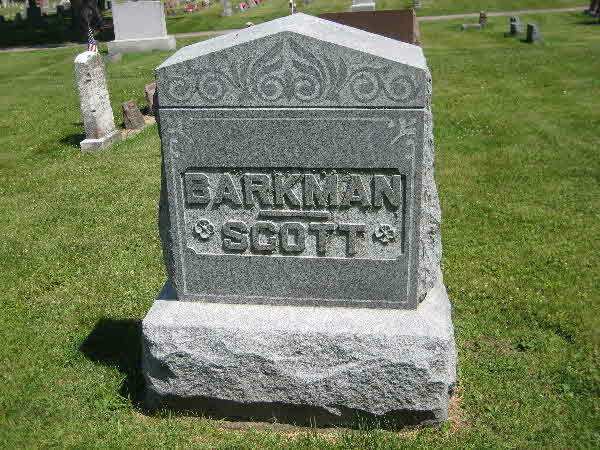 Death* Anna Eliza Barkman died in 1875 in Riverside Cemetery, Block 28, Oshkosh, Winnebago, Wisconsin, United States. 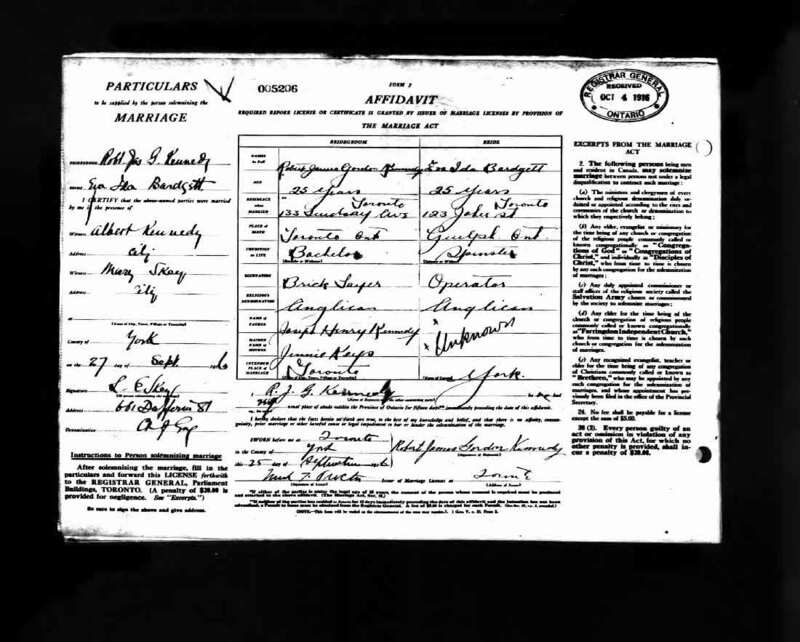 [S110] Ireland, Civil Registration Births Index, 1864 - 1958, online \, Birth Registration for Esther Florence Barkman or Croom, Ireland.